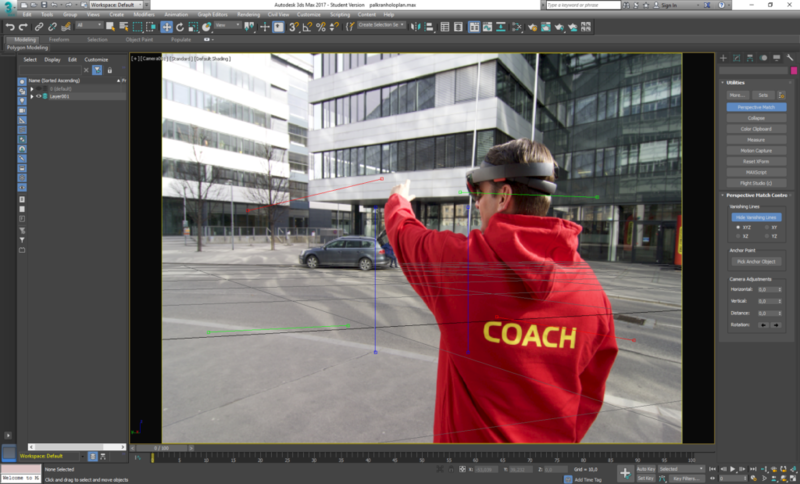 Here, I’ll describe an approach to use 3ds Max to simulate the view of a HoloLens user in 3rd person view. 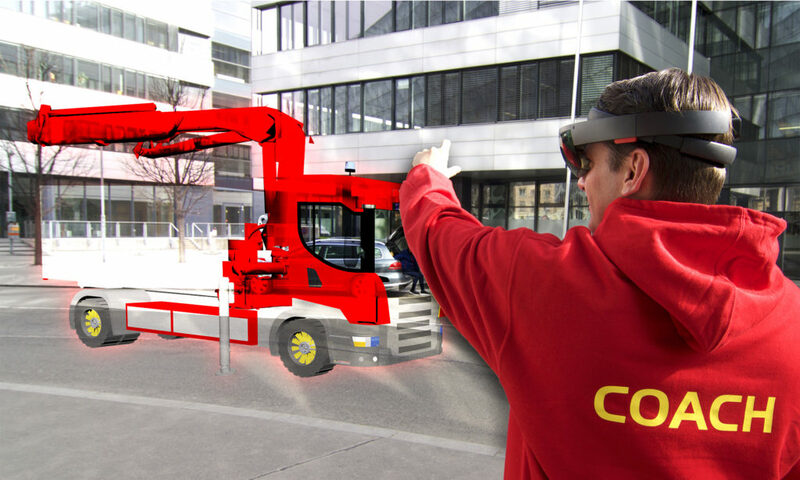 I used this for our PalKranHoloPlan AR8000 project, which we created during the Palfinger Hackathon. First of all, you need to get the Unity scene into a 3D software. 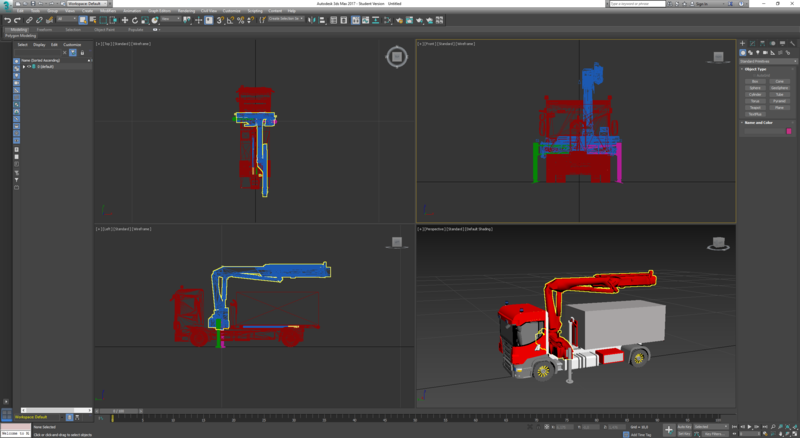 I used 3ds Max in this case. 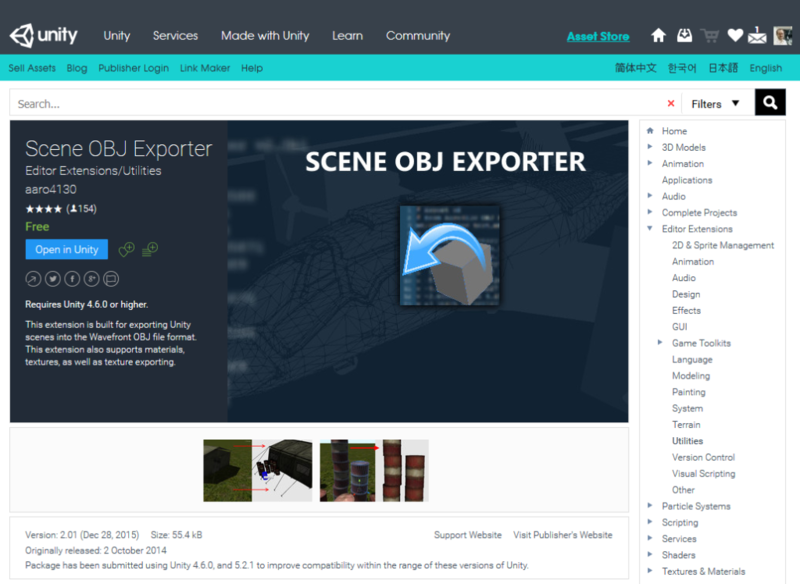 Unfortunately, Unity only includes “import” functionality, but no “export”. 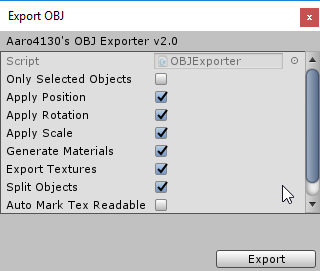 A good workaround is using the free Scene OBJ exporter from the Unity Asset Store. 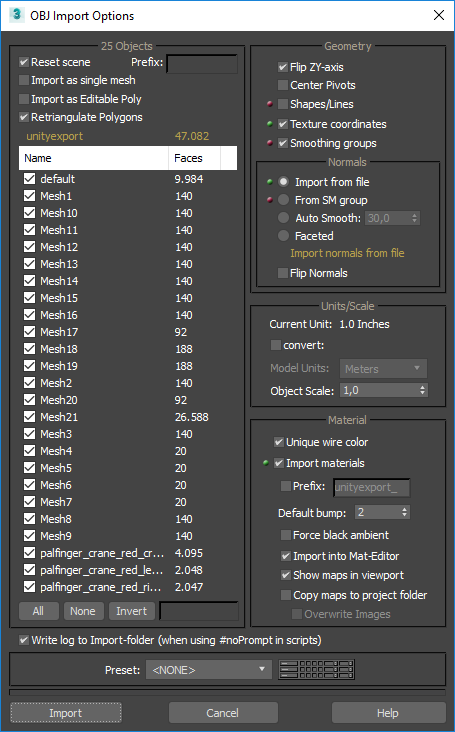 A more fully featured plugin would be Export2Maya ($60). 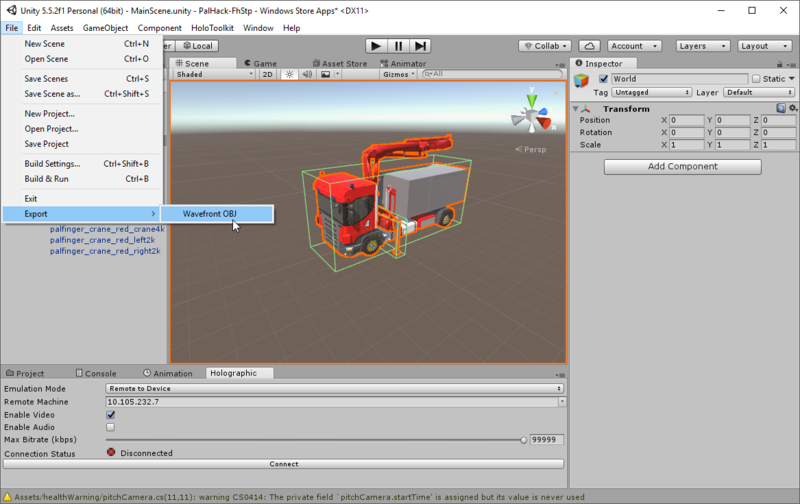 The next step is to match the perspective of the 3d objects with a photo of the scene where the user is interacting. 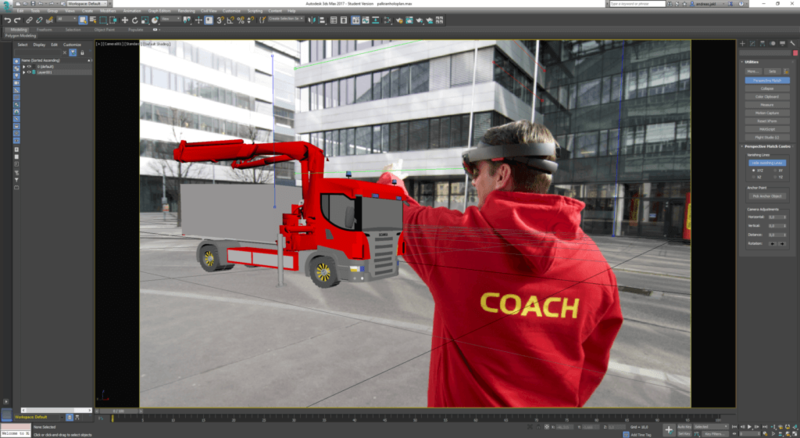 For this step, use the Perspective Match Utility from 3ds Max to align the scene with the photo. I’d recommend going the way using the free camera. 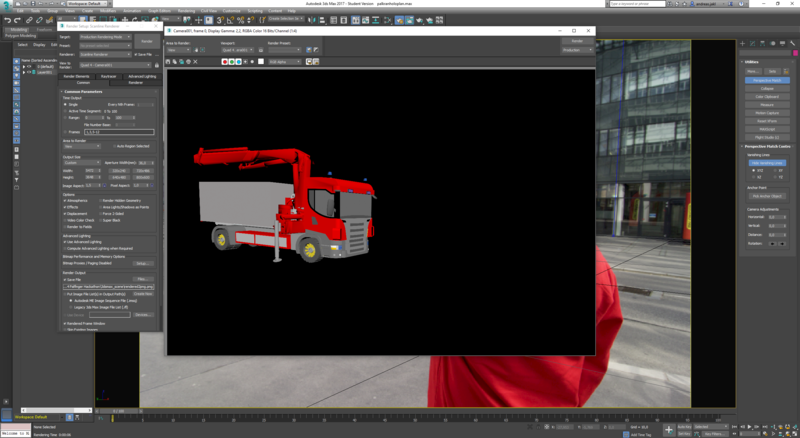 Set the image as background for the camera as explained in the 3ds Max documentation. While the perspective is already fine, we need to do some color corrections and ensure that the man is in front of the 3d object. First, render the scene to a png file with transparent background. Match the render output size with the pixel size of the photo. Afterwards, open the rendered file and the photo with Photoshop. Extract the person and put it in front of the 3d object. As the HoloLens has a light display that only adds light to the scene, it can not produce a fully opaque object. To simulate this, you can change the blending mode of the 3d object layer to “hard light”. Add some adjustment layers to create a better overall color impression. 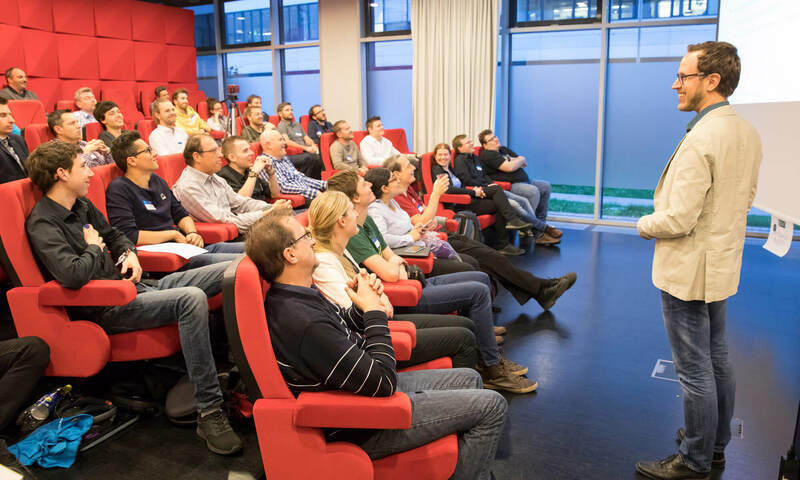 It also makes the scene a bit more clear if you add a bit of shadow between the person and the 3d object, as well as a bit of glow around the 3d object to visually indicate that the hologram is artificially added to the real scene. Following the guide, you can get a scene similar to the photo below. 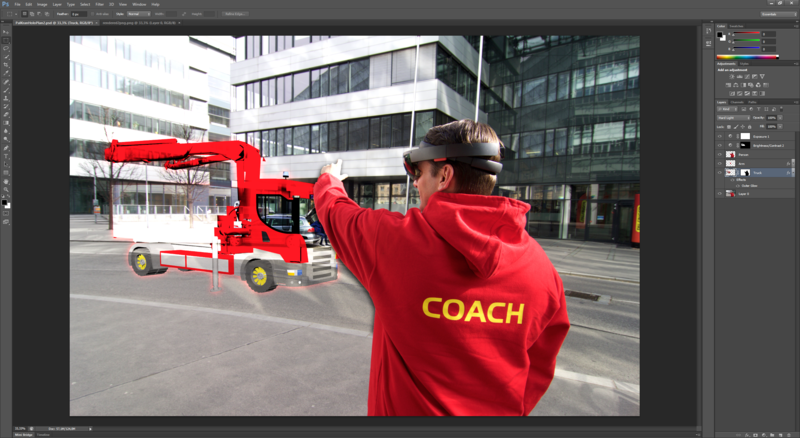 It’s a quick and easy way to simulate a HoloLens scene with a photo, without the need of a second HoloLens and still producing an accurate result with full perspective matching.